You are here: Home / News / Awards / Thank you for all your fantastic votes. Thank you for all your fantastic votes. 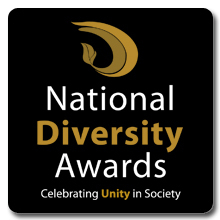 The votes have now closed for the National Diversity Awards. HyperFusion has been voted as Community Organisation for our work on LGBT+ bullying and prejudice. Thank you SO much to all of you of the amazing comments you sent in with your votes. We are so appreciative of all you champions. It’s fingers crossed time now to see if we are shortlisted …. watch this space. https://www.hyperfusion.co.uk/wp-content/uploads/2018/03/NDA-Inverted-Thumb-Square.jpg 220 220 Sarah Ellis https://www.hyperfusion.co.uk/wp-content/uploads/2019/04/Hyperfusion-TICBOX-Home.png Sarah Ellis2018-06-20 16:27:462019-01-09 13:21:28Thank you for all your fantastic votes.